My son tends to believe he's a super hero. He even wears ski goggles around town and keeps them on when we go into the store. For Thanksgiving, I made him a super hero cape. Not only does he love it, but his cousins play with it lots, too. 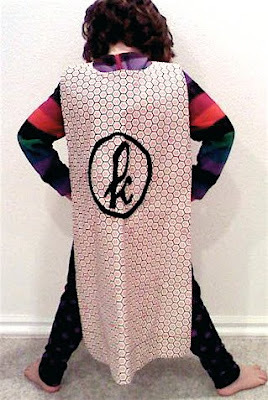 Since cousin Kaily had a birthday this week, I made her this Apron Cape. It does double duty, acting as an apron by day and a cape by night. And... you've guessed it... it's easy. To download the neck template go here. 1. Fold your fabric in half, the hot dog way. Put the neck template at the top and pin in place. Cut around the template. I like this style of neck because I'm paranoid and don't have to worry about ropes, strangulation, and all those cheery things us moms stress about. 2. Lay your ruler at the same angle of the template. And cut down the side. Unfold the fabric and you should have your cape. You need two of these pieces. One for the front, one for the back. 3. For the bottom corners, just lay a plate or something round onto the fabric and trace the curve. Cut along the curve so the corners are rounded. 4. I love typeface design... guilty by trade, I suppose. So, I put Kaily's first initial on the cape. I found a font I liked, printed it out to the size I wanted, and cut it out. I then pinned the paper letter to some wool felt and cut it out. 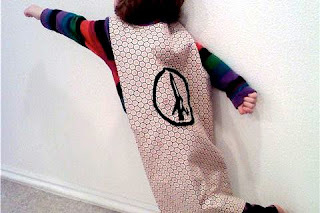 Once I was pleased with the design, I sewed it to the right side of the cape. LOVE wool felt. No need to fold under the edges or anything. Just sew around the edge and that's all you have to do. 5. Now put the front and the back pieces of your cape right sides together and sew them together. Be sure to leave a small opening so you can pull them right side out. Pull the cape right side out and whip stitch the opening shut. 6. Iron the cape flat, taking extra care along the curvy parts of the neck. 7. Sew the pieces of velcro to the neck, stitching with a simple "X" shape. You could even do button holes if you'd like. I just thought velcro would be easier for the kiddos. 8. Ta-da! Done! Super easy, super cute, super fun, and very versatile in purpose. My friend, Claire, made these for her two very cute boys. Cute! 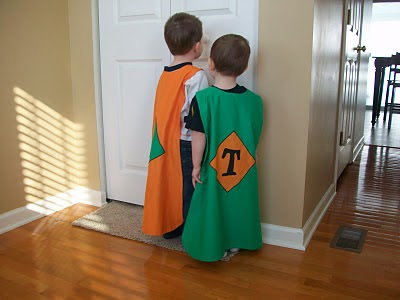 I made my boys similar capes for Halloween costumes a few years ago, and they still love to play with them! Where were you 18 years ago when my Super Hero was running around?! I too had one of those who didn't leave the house without his costume...Batman was usually the disguise of choice. His cape was fashioned with velcro and fabric, but was not as cool as yours. I'm sure even more bad guys could have been thwarted with a cape such as yours!! PS: He has now grown up into a normal adult who no longer must wear a cape or other super hero garb when he goes out in public. Just so you know that there is hope! However, I miss those days!